Personally, I’m very partial to cold cuts in the aftermath of the Big Christmas Day Blow-out and it’s rather nice to have a breather from all the cooking. 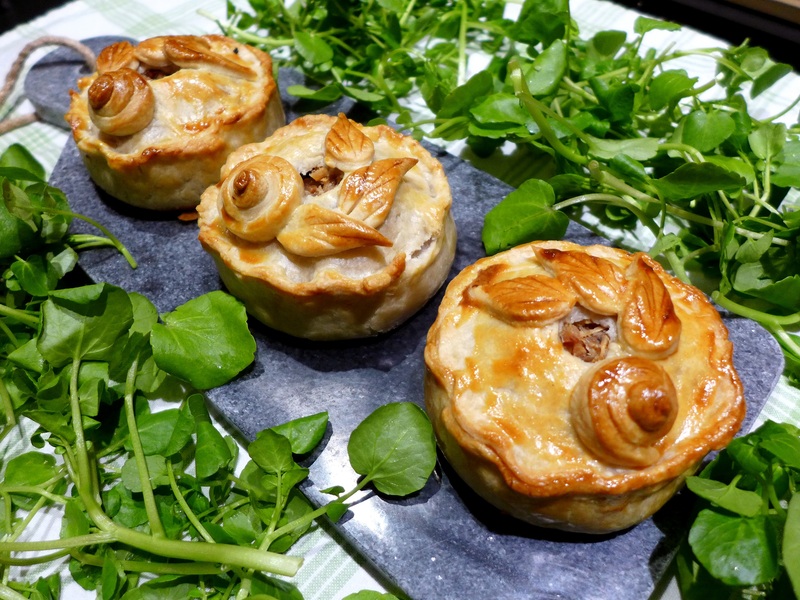 But if you still have ham and turkey sitting in the fridge after that, these little pies are a real treat and the cranberry sauce gives them a lovely flavour lift. 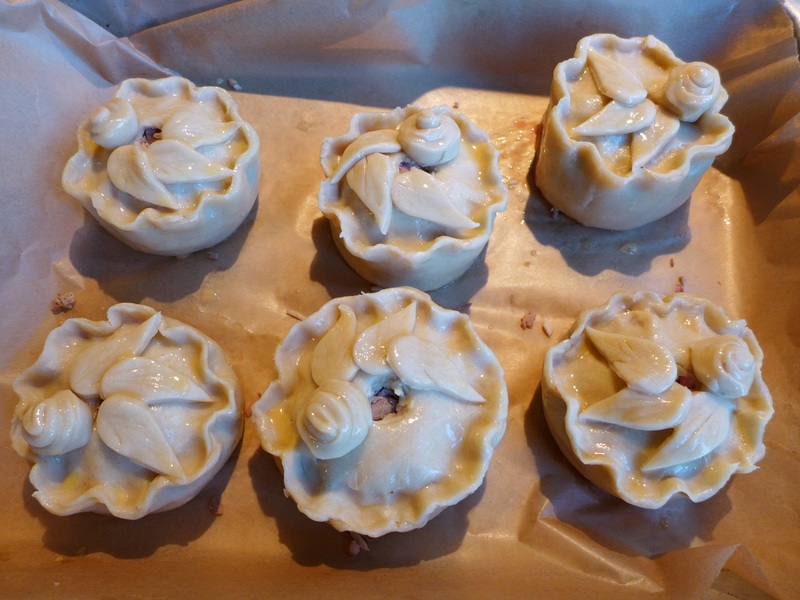 The trickiest part is unmoulding the hot water crust pastry cases prior to filling. The first time I tried making them in muffin tins but found it impossible to remove the pies without them falling to pieces. The second time I did it the old-fashioned way using jam jars as a mould, which worked better. You’ll need six jars with a diameter of about 7cm. The received wisdom when working with hot water pastry is to keep it warm. Then I read this post by Lynn Scarlet Clark suggesting chilling it and just warming it in your hands before use to make it easier to work. I re-made these pies to try the technique and she’s right, it makes the pastry cases easier to handle and less liable to collapse before filling. So that’s the method I’ve gone with here, thanks, Lynn. Of course you can make one big pie, using either a springform cake tin or a proper pork pie mould, in which case you line the inside of the tin with pastry and save a lot of angst. 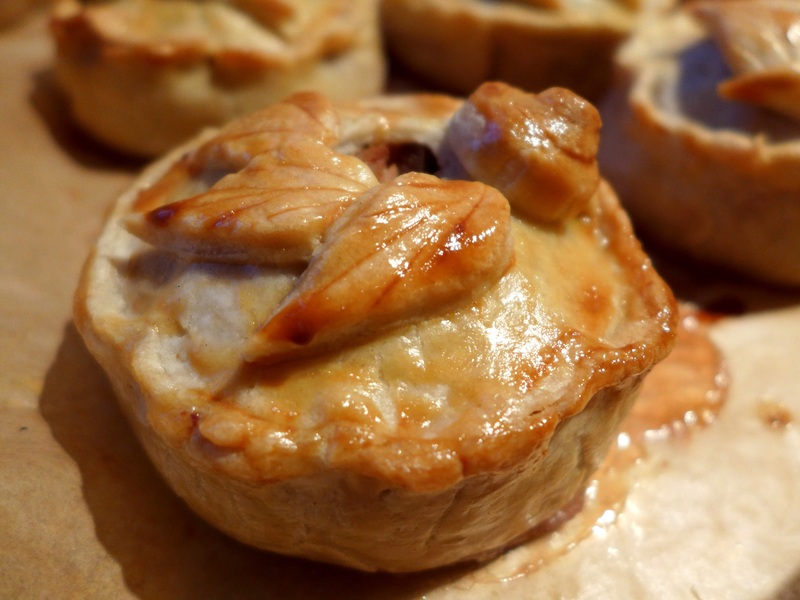 I like these little hand-raised pies though and if they go a bit wobbly-looking it’s all part of their rustic charm (oh yes it is, shut up at the back and save the heckling for the panto). They freeze well, too. Just defrost them thoroughly when you come to eat them, standing them on a rack to stop the pastry going soggy. Put the water, salt and lard into a saucepan and bring to the boil, cooking until the lard has melted. Sieve the flour into a bowl and gradually pour in the liquid, stirring with a wooden spoon until it has come together. Knead in the bowl until the dough is smooth and malleable. Place in the fridge while you prep everything else. Pre-heat the oven to 180C/350F/Gas Mark 4. Put a baking sheet in to heat up. 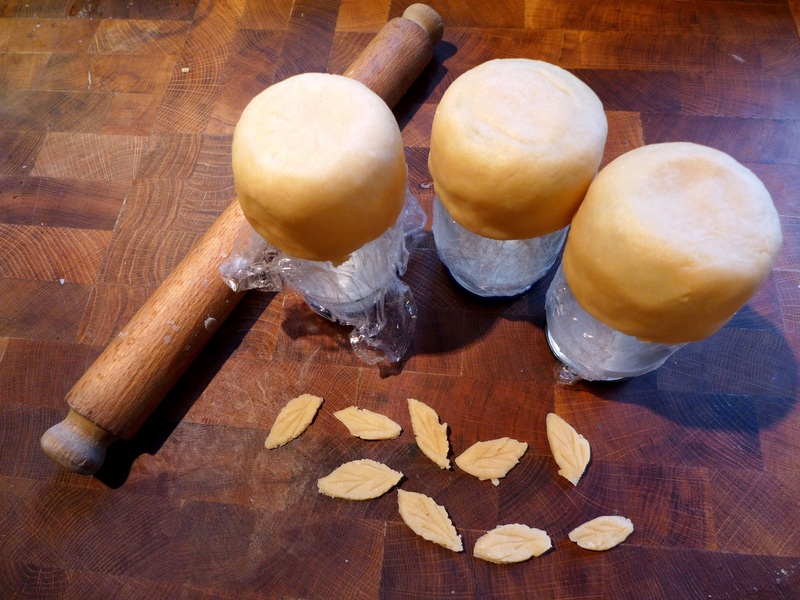 Turn your jam jars upside down and wrap the bases and sides with cling film, oiling the outside of the plastic wrap to stop the pastry sticking. Mix the diced turkey and ham with the sausage meat and season well. I know the ham is salty but like pork pies, these need extra seasoning otherwise they taste insipid once they have cooled. Take two-thirds of the dough (weigh it) and divide it into six balls. Working one pie at a time, roll a ball in your hands to warm it and then flatten with a rolling pin to form a disc about 12 cm across. You won’t need to flour the board as the lard content stops it sticking. Place a circle over an upturned jar and gently push the pastry down the sides until the casing is about 5cm deep. Repeat until you’ve done all six, trimming any rough edges. Re-roll the trimmings to make decorations. Allow the cases to set for five minutes. Carefully remove the jam jars and cling film, loosening with a knife if necessary. If the pastry splits, just squidge it gently to re-form it. Put the cases on a baking tray lined with baking parchment in case of leaks. Fill a third full with the meat mix, packing it down as much as you can without distorting or cracking the cases. 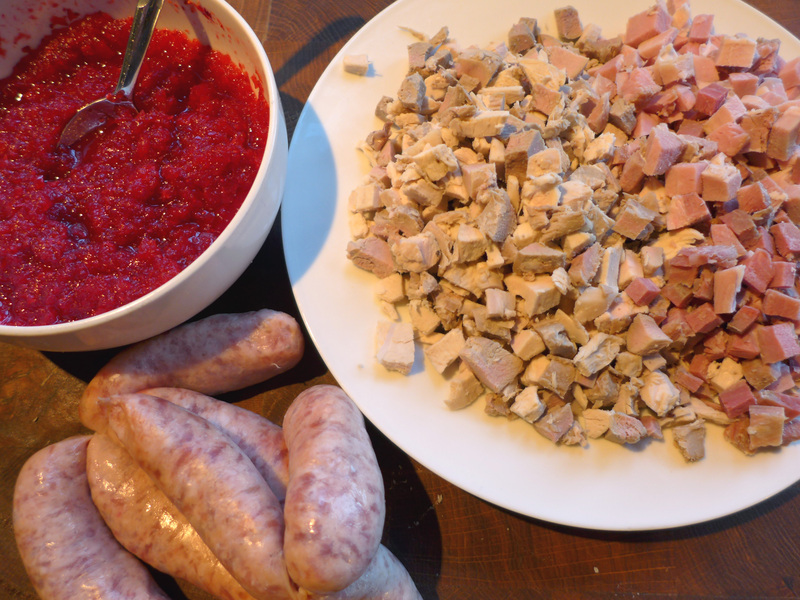 Add a layer of cranberry sauce, then more of the meat mixture, stopping just below the top. 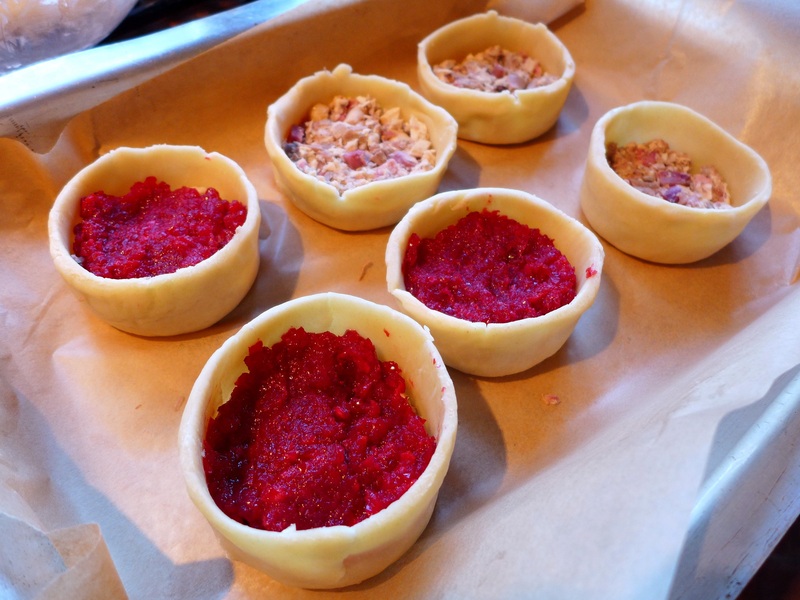 Roll out the remaining dough and cut out lids to fit your pies. 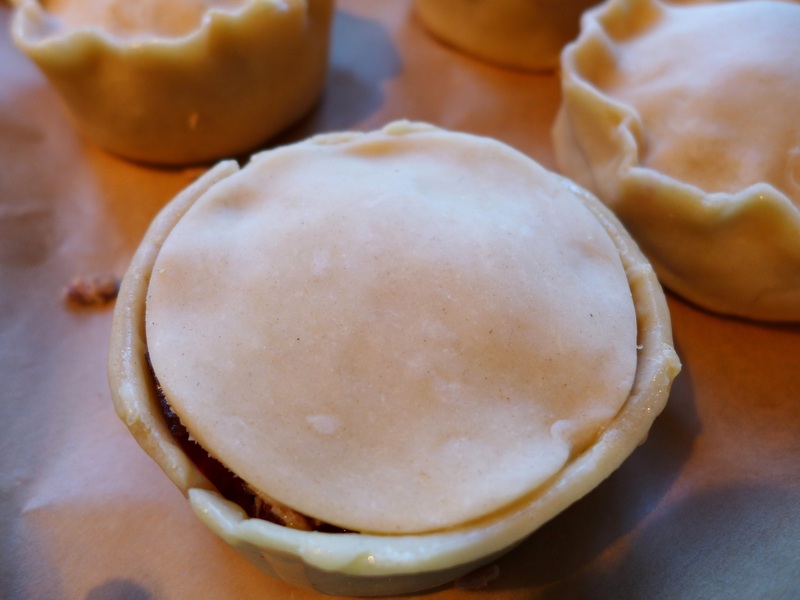 Paint a little beaten egg round the top edge of the pies and put on the lids, pushing them inside the outer edge and pinching to seal. Crimp using the thumb and forefinger of one hand and the forefinger from the other hand to give a wavy edge. Cut a hole in the top for the steam to escape. Brush the top and sides with egg, add your decorations and glaze those too. Slide onto the pre-heated baking sheet and cook for about 45 minutes to an hour, or until the pastry is crisp and golden, then remove from the oven. Cool on the tray for 10 minutes then remove to a wire rack to cool completely. They’re good with a peppery rocket and/or watercress salad (try chucking in some mandarin orange segments and walnuts) and a crisp winter coleslaw. This entry was posted in Chicken and other poultry, Mains, Pork, ham and bacon and tagged Christmas leftovers recipes, Christmas recipes, hot water crust pastry, Turkey ham and cranberry raised pies by Linda Duffin. Bookmark the permalink. How very English of you Linda. 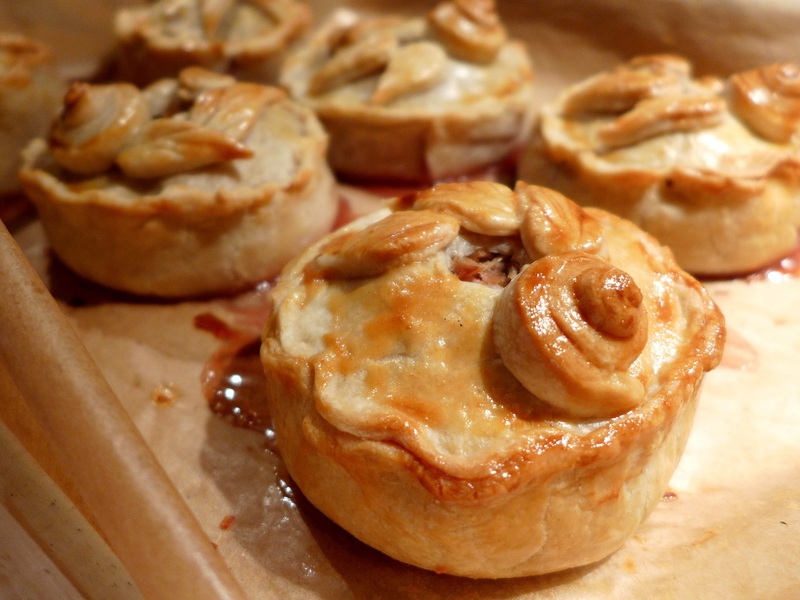 My Granny used to make pork pies, I salivate at the thought of them. They look a tad tricky though…. So pretty! They are very Hampton Court. How was the food course, by the way? I was so tempted by it. You make these sound easy! They sure look wonderful, and the ingredients sound like a perfect combination. Thanks! Thank you, Cindy. The only tricky bit is unmoulding them from the jam jars, but if someone as clunky as me can do it, anyone can! All the best, L x. One of the sad things about Christmas is that we were invited out by friends on the day. That of course was wonderful. But now I have not a single leftover. As far as I’m concerned, picking over the the scraps and using the bones themselves is the best bit. Those pies of yours are very beautiful. They look fabulous – and all the better for being hand raised 😘👏👏 You know I prefer the handmade look to one baked in a tin, I’m sure they taste better for it too! I’m delighted anything I’ve said has helped: I think I may have to print out your recipe and frame it – just so I can prove that someone at least once found me useful!! I love the idea of these pies, Linda, and yours look more like works of art than pastry. You’ve assembled a great combo of ingredients to fill them, too. I normally use my leftovers for sandwiches but, given that I’m still recuperating from the damage wrought by a turkey sandwich in November, maybe pies are the way to go in the future. ‘ve plenty of time to decide but I’m pinning the recipe just in case. Thanks. I hope you and yours enjoyed a wonderful Christmas and may 2017 bring you all good health, peace, and joy.